The poinsettia has a long history of cultivation starting with the Aztecs in Mexico. The poinsettia is called cuetlaxochitl by Native Americans and this woody shrub to small tree is native to the tropical areas of southern Mexico and Central America. The Aztecs made a reddish dye from the bracts and a medicinal preparation from the latex. It was widely cultivated in gardens. In the 17th century, Franciscan priests began using the flower in the Fiesta of Santa Pesebre nativity procession. Since the plant flowered naturally during the Christmas season, it became readily linked with the holiday. The poinsettia was introduced to the United States in 1825 by Joel Poinsett, the first U.S. ambassador to Mexico. 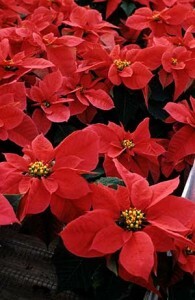 The name poinsettia is derived from his name. The botanical name for the poinsettia is Euphorbia pulcherrima. Albert Ecke began growing poinsettias as a cut flower after moving to Hollywood in 1906 and starting a cut flower farm. After moving to Encinitas, CA, the Ecke family focused on field grown poinsettia mother plants, which were shipped throughout the country via railroad box cars. According to the University of Colorado, active breeding of the poinsettia began in the 1950s in an effort to develop cultivars that would retain their leaves and bracts for a longer period. Early breeding efforts included those of Mikkelsen of Ohio (Mikkelsen series), the Heggs of Norway (Hegg series), as well as those of the Ecke family (Eckespoint series). The Fischer family, a German breeder, has also contributed many cultivars to the poinsettia tradition. These breeding programs focused on stronger stems, leaf and bract retention, multiple branching, earlier blooming, and color variation.